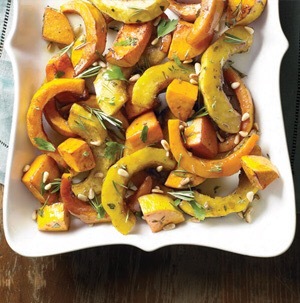 Herb-Roasted Squash | This RD Eats! ← Sweet Potato or Yam? What’s the Difference? There are many ways to make squash, but my personal favorite is savory instead of sweet. It is simple to make and uses ingredients that I always have on hand. The addition of pinenuts add some crunch to a creamy dish. You can also substitute slivered almonds in a pinch. 1. Preheat oven to 475 degrees. Line an 11-by-15-inch rimmed baking sheet with aluminum foil. 2. Place squash cubes in a large bowl. Set aside. 3. Whisk together olive oil, vinegar, garlic, parsley, salt, black pepper, rosemary and thyme. Pour over squash and toss to coat. Spread in a single layer on prepared baking sheet. 4. Bake 35 to 45 minutes, stirring every 15 minutes, until squash is tender and golden brown. Garnish with pine nuts. This entry was posted in Recipes and tagged acorn, butternut, herbs, squash. Bookmark the permalink.